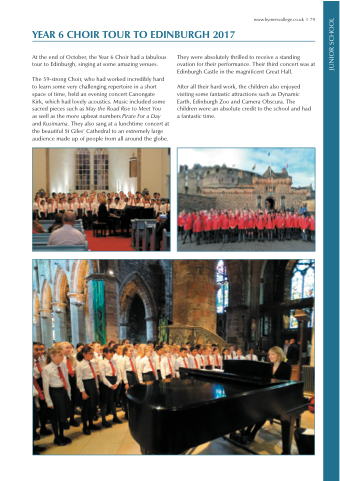 At the end of October, the Year 6 Choir had a fabulous tour to Edinburgh, singing at some amazing venues. as well as the more upbeat numbers Pirate For a Day and Kusimama. They also sang at a lunchtime concert at the beautiful St Giles’ Cathedral to an extremely large audience made up of people from all around the globe. They were absolutely thrilled to receive a standing ovation for their performance. Their third concert was at Edinburgh Castle in the magnificent Great Hall. After all their hard work, the children also enjoyed visiting some fantastic attractions such as Dynamic Earth, Edinburgh Zoo and Camera Obscura. The children were an absolute credit to the school and had a fantastic time.